March 2014 – Tools for strategic and strong-minded thinkers! I was facilitating a workshop to encourage more discipline in project planning and delivery. I was well acquainted with the organization from the CEO down, and I was concerned. I knew participants would be distracted by their laptops and mobile devices because the continuing imperatives of responding to business operations in the midst of making the biggest ever company acquisition. Every workshop leader and facilitator knows the challenge of gaining and maintaining the attention of participants. I pondered this strategic question on the plane ride: How do I create motivation and energy for the meeting? 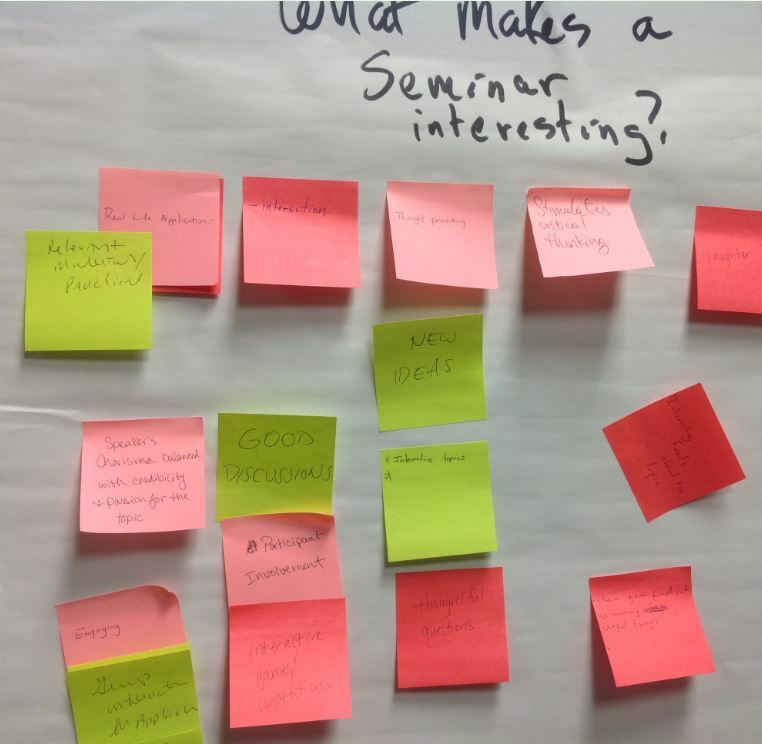 As I thought about that question, I realized a creative insight: I would start off the seminar with this question: What makes a seminar interesting? The next day, at the start of the workshop, I wrote the question on a flip chart page. I gave the participants sticky notes and asked them to write short responses on the sticky notes. I instructed them to post the notes to a page and categorize them (see the nearby photo). I also announced, “I’m here to help you get promoted.” That was a learning from earlier in the year when I found that the message resonates with people, especially those in the early and mid-stages of their career. At the surface, this vignette is just a “how to” insight. But at a deeper level, there are more profound lessons that apply to strategic thinking. First, I recognized an underlying structure that was retarding engagement, and thus strategy execution. I define the underlying structure as a system of interactions that produce recognizable behaviors. They reflect the context. To understand a strategic situation is to understand the a peculiar underlying structure. Here is a brief description of context: This company’s top executives seldom actively engage in the sponsorship strategic initiatives, except for acquisitions. As long as operating units make their profit projections, there is little interaction with headquarters. From a governance perspective, this highly decentralized organization leaves people alone to apply their own judgment. Further, moves to gain efficiencies are often thwarted by passive aggressive behaviors (agreeing to support new ideas, and then fighting those same ideas when they affect the local operation). Also due to decentralization and the global scope, people mostly work electronic communications, especially text and email. They find communicating through gadgets to be less ambiguous that working face to face with people. The result for this company is that an short-term operational rhythm dominates its underlying culture. The underlying structure is one of habits, two being: short-term operational behaviors and the pre-occupation with mobile gadgets. Second, I used a strategic question to foster reframing the expectations of the workshop participants. Although short-term concrete reactions (have an interesting and fun workshop) were important, we realized more of a balance of looking longer term and more strategically. In this decentralized organization, people could understand career success better than they could understand enterprise success. It’s easier to talk about successful strategy execution when people can see a direct linkage to their paycheck and their career. There is a third element of strategic thinking in this story. When I developed my insight, I expected people to say that an interesting seminar would result in their beliefs being challenged. Instead, the participants wanted fun and interaction; they didn’t want drudgery. The concept of “beliefs” is just to deep – and potentially scary. The solution needed to be pragmatic. Good strategy has to adapt to local situations and the stories of strategic stakeholders. Do you agree that it is useful to look for the underlying structure, to work on reframing, and to test your hypotheses?